The Wedding Hours of Bianca Maria Sforza and Maximilian I. Wedding gift of Ludovico 'Il Moro' Sforza to his niece. Manuscript on vellum, illuminated by the Master of Anna Sforza. Italy, Milan, 1493. 98 x 70 mm. 235 leaves, with 15 full-page miniatures, 14 of which are accompanied by an elaborately decorated text-page with full, historiated borders. 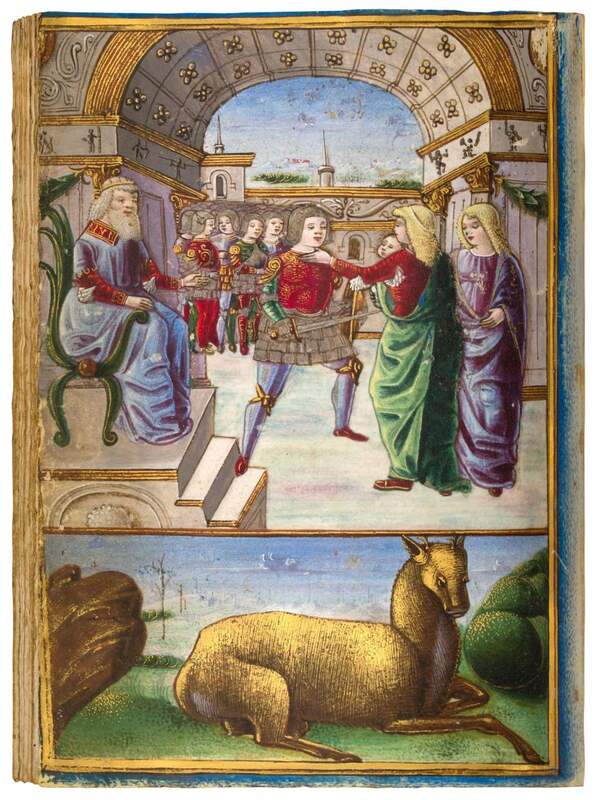 A sensational new discovery, this extraordinary manuscript demonstrates the high level of Renaissance illumination made for the Sforza family in Milan. 98 x 70 mm. – 235 leaves. With 15 full-page miniatures, 14 of which are accompanied by an elaborately decorated text-page with full, historiated borders. The Wedding Hours is a highly important work of cultural heritage and is of exceptional historical and art-historical value. This manuscript is the long-lost wedding gift created for Bianca Maria Sforza (1472-1510) upon her marriage to the Holy Roman Emperor elect, Maximilian I of Austria-Habsburg. This Book of Hours was commissioned by the noblewoman's uncle, Ludovico 'Il Moro' Sforza and not only testifies to the high level of Renaissance art made for the Sforza family in Milan, but also shows how art was used to link social, religious, and political life. The famed marriage by proxy between the niece of the Duke of Milan and the Emperor's son was celebrated with great pomp in Milan on 30 November 1493. The jewel-like illumination was designed to honour and perpetuate the Sforza family bond once the bride was living north of the Alps. The entire manuscript is lavishly illuminated with opulent Renaissance motifs in gold and saturated colours. From her finely painted book, Bianca Maria could pray for saintly support or for salvation of the souls of her closest relatives. At the same time, she was reminded of the warmth of the southern colours and the splendour of Renaissance art from her native Milan. See also our video featuring this imperial wedding gift.